I have always been lazy when it comes to skin care. I was never too careful until I started wearing makeup. Trying out different moisturizers is something I love to do as I am seeking for the perfect range to get a perfect skin. It was last Christmas while I was walking around boots that I came across some great gift sets one of them being from No7. To be honest, I have only tried one No7 product – a foundation – and I was not keen on it at all. I am sure they have some great makeup products but that one was not for me. On the other hand, their skin care products always intrigued me and when I came across a No7 Skin Care gift set, I was sold. 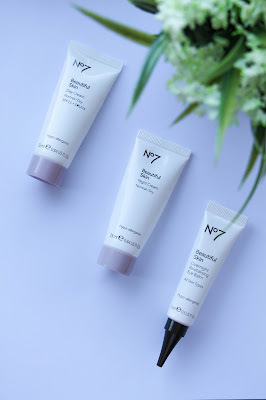 This gift set included five products from the No7 Beautiful Skin range for only £14 and I have been trying them out for the last month and an half. The products are all sample size but for the price I could not ask for more. They are hypo-allergenic and suitable for normal to dry skin. It comes with quite a good amount of product, perfect for a try out if you want to just test and see how your skin reacts – exactly what I wanted to do. The Cleansing Lotion is quite light and refreshing and when rubbed into your face – either with a cotton wool or your fingers – it removes makeup in a blink of an eye. I apply it on my dry skin and rub it in for a couple of minutes and then with a wet face clot, I gently remove everything and I can say that most of my makeup is gone. This product is not appropriate to remove eye makeup but other than that I really like it. With this cleansing lotion I remove my makeup much quicker than before. 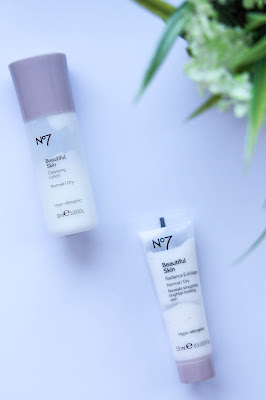 Exfoliating my skin is something I try to do at least twice a week and the No7 Beautiful Skin Radiance Exfoliator is revealing to be a great product. I still love my Neutrogena Pink Grapefruit Daily Scrub but the No7 Radiance Exfoliator is much smoother on the skin so it is great when I have more sensitive skin or areas of my face where I need to be extra gentle. It claims to sweep away dead skin cells and impurity, revealing a brighter and more beautiful skin. I have to say that I don’t reach a lot for this product but it is only because I do love my Neutrogena Pink Grapefruit Daily Scrub. Now the moisturizers, they are something I am falling in love for and they are, most likely, the ones I will repurchase. The day cream as a much thinner consistency than the night cream but they are both equally very hydrating and smooth on your skin. It is impressive the difference on my makeup application when I moisturize my skin with the No7 Beautiful Skin Day Cream. The night cream is such a great product! Its thicker consistency feels great at night when I apply it before going to bed. The morning after, I wash my face and it feels so, so smooth. I am totally in love with these products and I need to repurchase them asap. Eye cream was never something I would purchase for myself but after trying the No7 Overnight Revitalising Eye Balm I am mesmerized with the things that a good eye cream or balm can do. This is a product for all skin types and it claims to improve dark circles and puffiness. You should not expect to not have any dark circles while applying this – you will have them, they will exist. The difference is that they will be much less intense/dark. I noticed that on myself. It also feels very hydrating and this is a great thing if you wear makeup as you always want your under eyes to be moisturized prior to makeup application. Overall, I have to say that I am quite happy and impressed with these products, so much that I will be repurchasing a few of them. If I go back to the moisturizers I was using before, it will never feel the same so.. Boots, here I go! 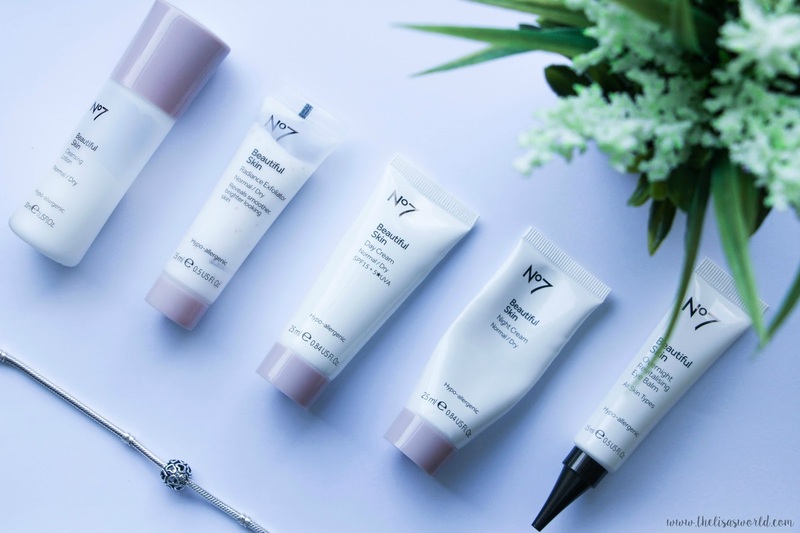 Have you tried any of the No7 skin care products? What are your thoughts on them?